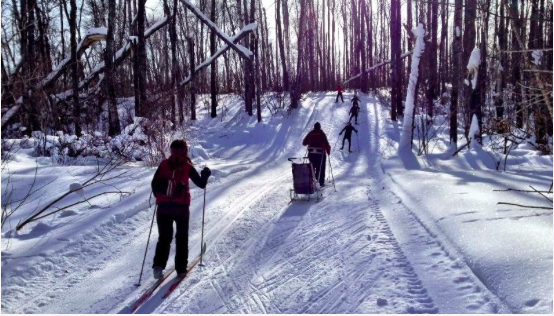 Join SaskOutdoors and the Kamsack Ski Club for a family friendly ski loppet and weekend retreat at Duck Mountain Provincial Park each year in late February. The loppet is a great gathering of skiers who ski on a groomed trails, either classic or skate, of various distances: 5km, 10km, 20km, 30km, or 45 km. Some warm drinks and cookies are provided at the heated shelters along the trail during the event. After the loppet, there’s a celebratory banquet supper to mix, mingle, and compare shades of red cheeks. For more information visit the Kamsack Ski Club's website. Shared accommodations are cabins at the Duck Mountain resort with two bedrooms and a pull out couch per cabin. Bedding is provided. The cabins are equipped with kitchenettes that Sask Outdoors participants will use to prepare snacks, Saturday breakfast and lunch for the trail, as well as Sunday breakfast. Cabin life will be pretty laid back, but you’ll have the opportunity to participate in snowshoeing, tobogganing, bonus skiing, bird watching, games, and storytelling – note that you must provide your own gear for all activities. A stopover Sunday afternoon at the Gallagher Centre Water Park has been a popular cap to the weekend, but stopping is not required. The Water Park includes a wave pool, whirlpool, lazy river, two storey waterslide, sauna, steam room, and over water climbing wall – so pack your swimsuit! !